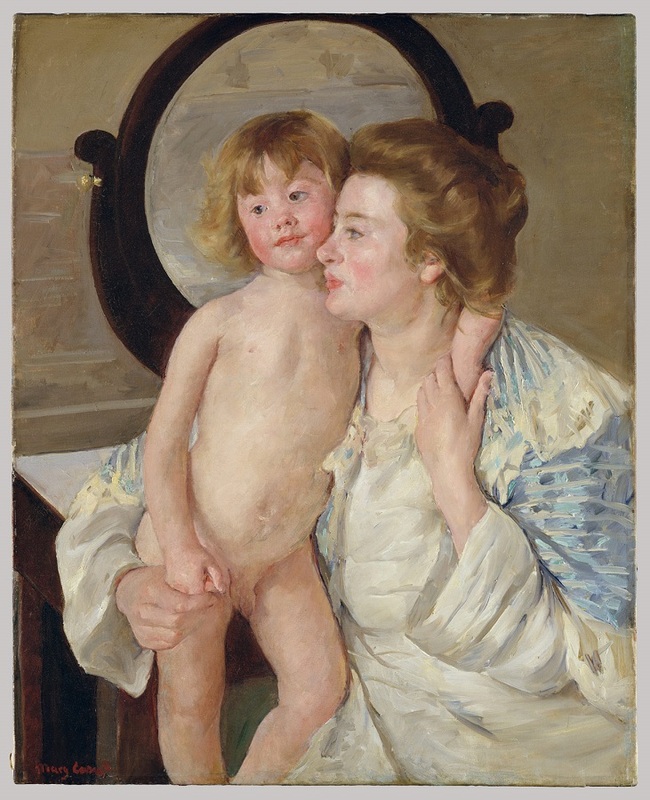 Mary Cassatt (1845-1927) was an extraordinary young woman, the daughter of a wealthy Pennsylvania family, who against her parents’ wishes began studying painting at the Pennsylvania Academy of the Fine Arts in Philadelphia, at the early age of fifteen. She made her studies from 1861 through 1865, the duration of the American Civil War. Among her fellow students was the rustic realist Thomas Eakins. She went to Paris to continue the study of painting, since women could not yet attend the Ecole des Beaux-Arts, Cassatt studied privately with the highly regarded master Jean-Léon Gérôme. 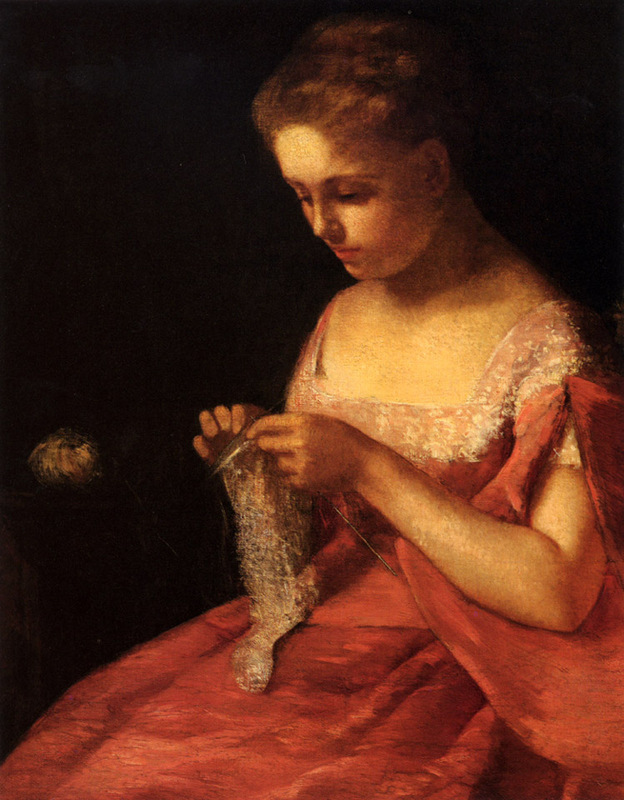 Cassatt’s early work, Young Bride, with its somber pallet of earth tones is similar in mood to the work of her contemporary Eakins. 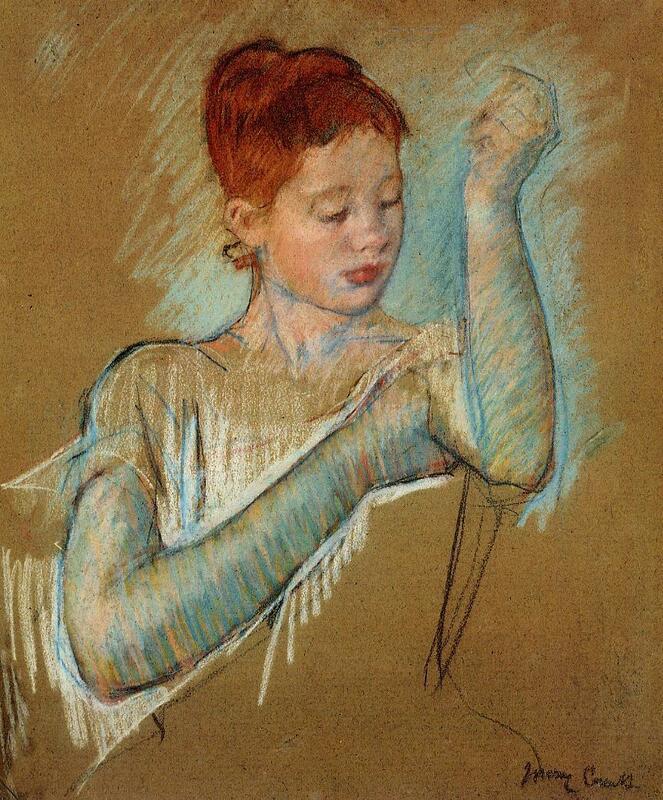 The work of Edgar Degas made a powerful impression on Cassatt when she encountered them in an art dealer’s window in 1875. 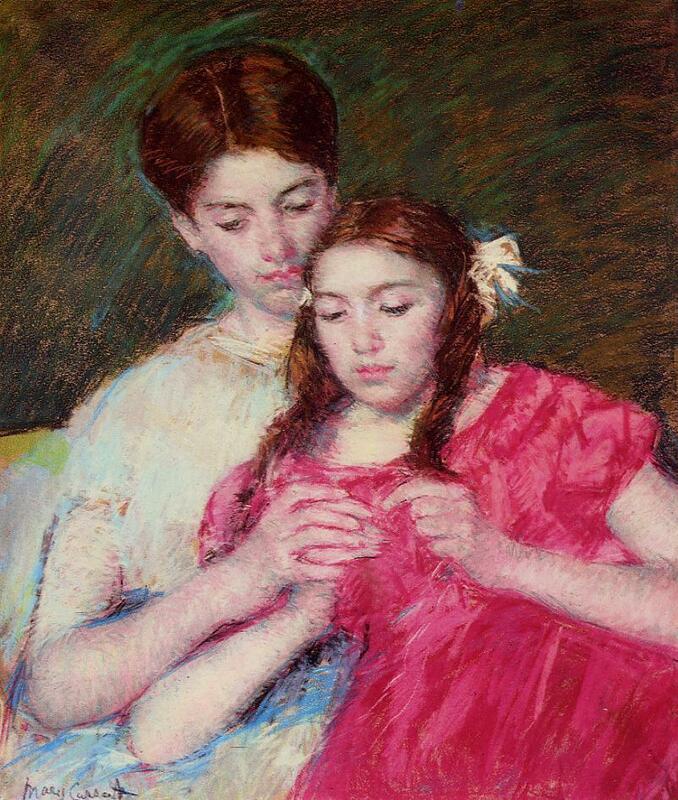 Degas later invited her to exhibit her work in Impressionist show, planned for 1878, which (after a postponement because of the World’s Fair) took place on April 10, 1879. 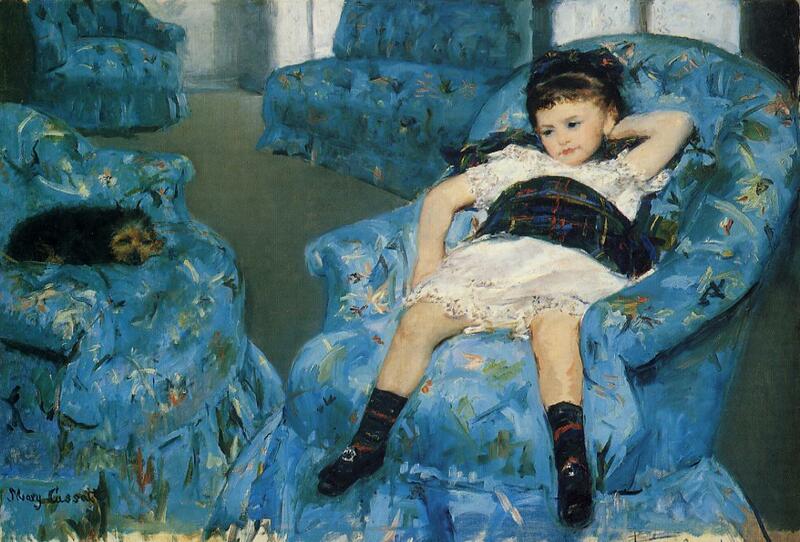 Only three years after Young Bride was painted, Cassatt painted her lovely Little Girl in a an Armchair. 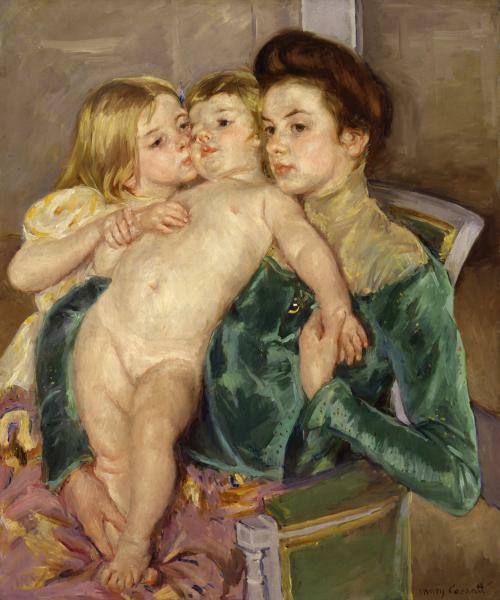 Cassatt was not an imitator of Degas or of anybody else. She developed her own distinctive style of precisely defined form, which she combined with impressionist informality of subject and composition. It is customary to say about any woman painter, as if it were the ultimate compliment, that she paints with almost the vigor of a man. 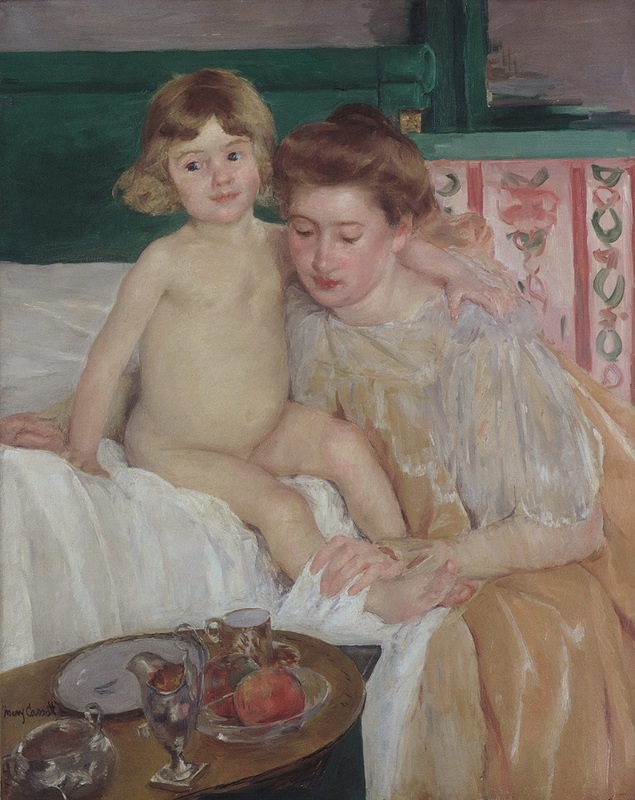 But the beauty of Cassatt’s art is its femininity, which in her case is not to be confused with weakness, indecision, or an only partial achievement of a masculine standard. One would not want to “strengthen” Little Girl in a an Armchair any more than one would want to endow its lovely sitter with the muscles of a wrestler. The above passage was taken from the chapter Evolution and the Brain. Dijkstra claims Darwinian theory influenced writers and artists to believe women were less evolved than men, therefore, it was presumed that women should be represented as “brainless” in “their primitive and natural unity”. 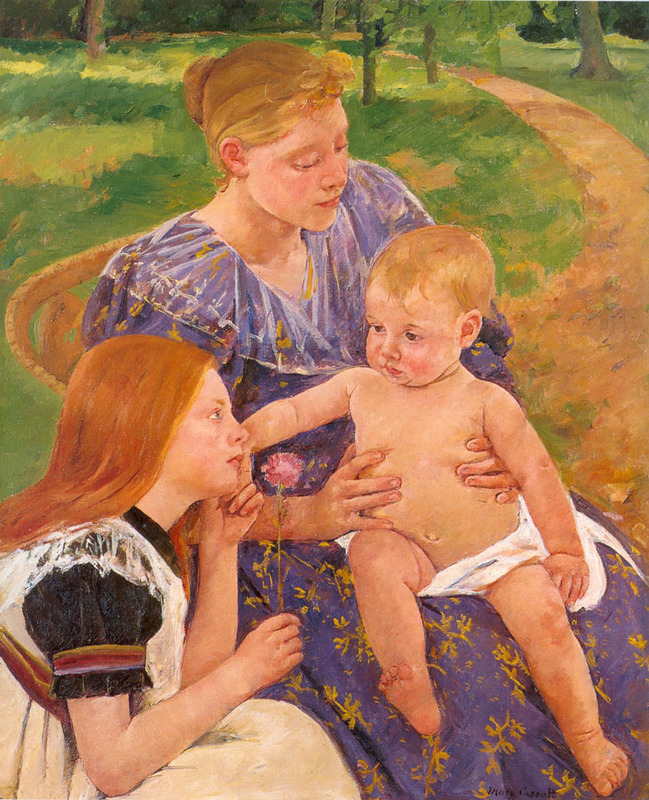 While there is truth in that Darwin’s bigotry did influence some artists, Thomas Theodor Heine’s painting The Flowers of Evil is a good example, Dijkstra’s reading of Cassatt’s Caress is delusional. I see Caress as an intimate portrait of a mother with two children which may have been inspired by Renaissance paintings of the Madonna. I do not see a portrait with ” heads jammed together” that was painted by Cassatt to appeal to Darwinian ideology which perceived women as “brainless” creatures. Because I had the good fortune to have a loving mother I am able to experience the work without resentment. It should not be a surprise that soul starved individuals who never experienced the necessary level of love from their parents would be swept into postmodern deconstruction to assault tradition and the family. Miller recognized how Hitler was able to manipulate the hatred for the Jews for his own purposes. In our time, technopoly is manipulating a soul starved society’s hatred of the family for its own ends. Current postmodern agendas seem to have a predecessor in the writing of B.F. Skinner who thought autonomous man was a construct which must be abolished for civil order to be maintained in society. Such a program can only be described as fascist. A friend just recommended Wilhelm Reich’s The Mass Psychology of Fascism, it appears Reich supports my argument. To counteract this destructive trend could not be more difficult. We live in a post-historical age in which people are narcotized by the mass media present. Western culture is rapidly losing touch with its symbols for expression. The only solution I see is to respect the expressions of eternal, ageless, human themes in culture before they are lost.